Induction coil, Landscape before seismic events. Some impulse noise would seem to precede the earthquake, but at the same time the Medicina monitoring Station, at the same distance, did not detect anything. Then no RF signals correlated with earthquake event. 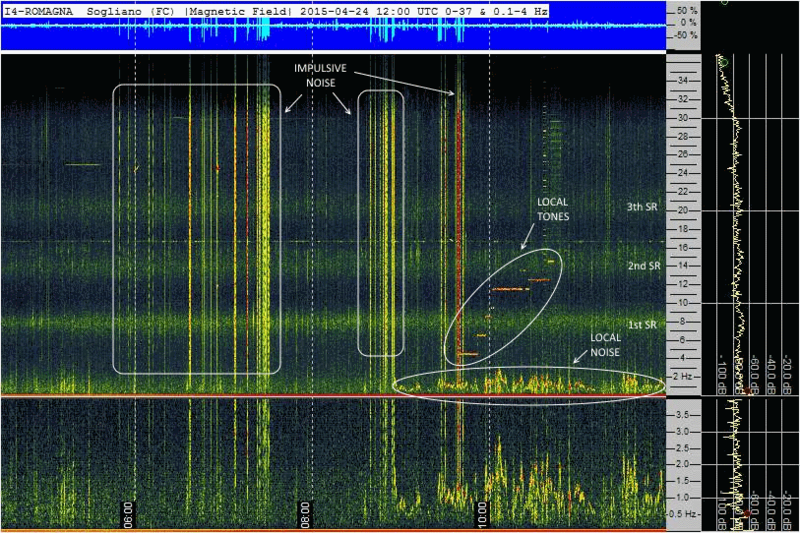 Schumann resonances on right. Induction coil, seismic events marked with white arrow. No RF signals correlated with earthquake event. 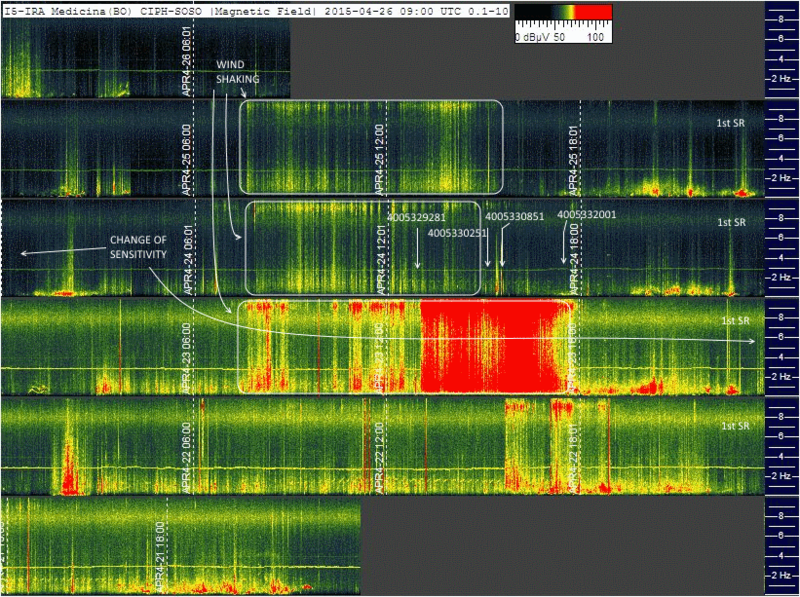 Schumann resonances on right. Induction coil, daily strips, seismic events marked with white arrow. No RF signals correlated with earthquake event. Induction coil, Landscape before seismic events. Bad weather and the wind shakes the coil. No RF signals correlated with earthquake event. 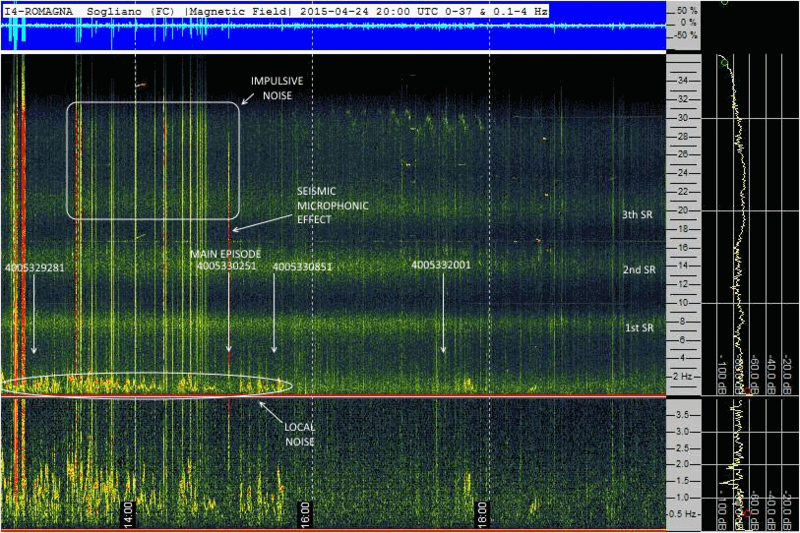 Schumann resonances on left. Induction coil, daily strips, seismic events marked with white arrow. 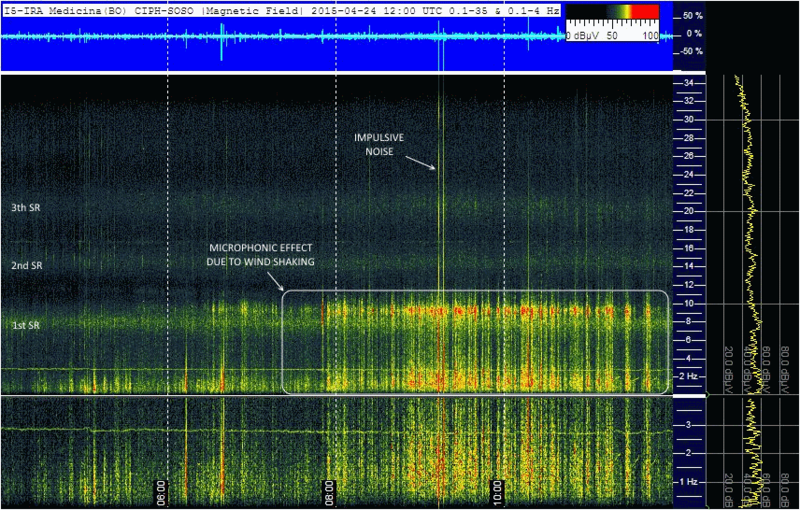 Change of sensitivity of spectrograms, between 23 and 24 apr, due to a maintenance operation. No RF signals correlated with earthquake event. Boltek sensor (static electric field), seismic events marked with orange lines. Ordinary situation before and during seismic sequence.No RF signals correlated with earthquake event. Boltek sensor (static electric field), seismic events marked with orange lines. No RF signals correlated with earthquake event. 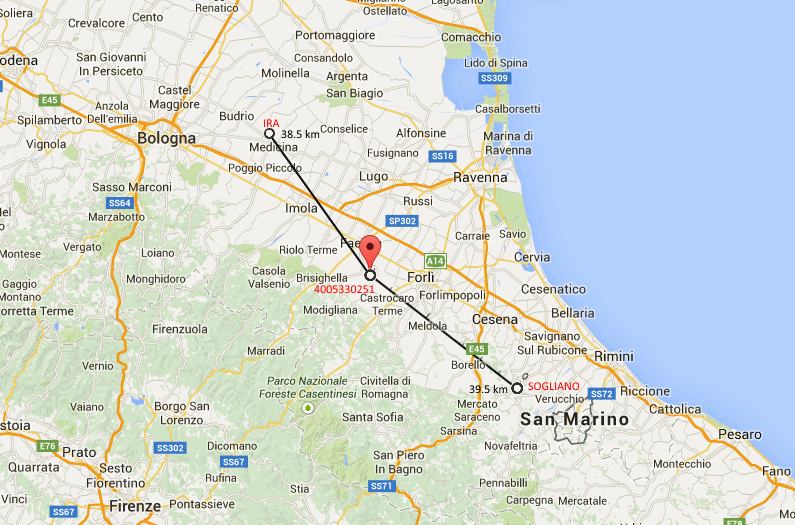 Mixed analysis from Monitoring St. 04 - ROMAGNA OBSERV.ATORY From Sogliano al Rubicone (FC), N Italy. 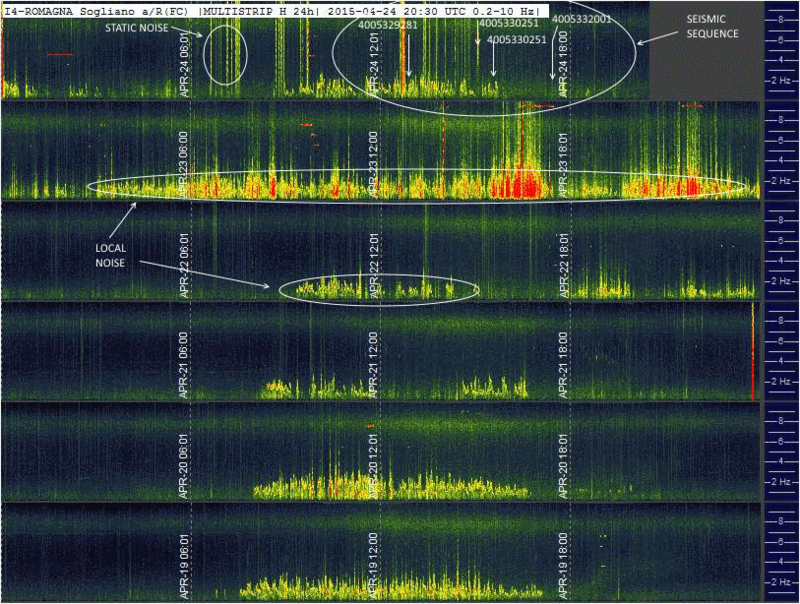 Induction coil, wave source file analyzed with Audacity, seismic events marked with red lines. No RF signals correlated with earthquake event. Schumann resonances on right. Induction coil, as before but with 0-9 Hz frequency window: seismic events marked with red lines. No RF signals correlated with earthquake event. 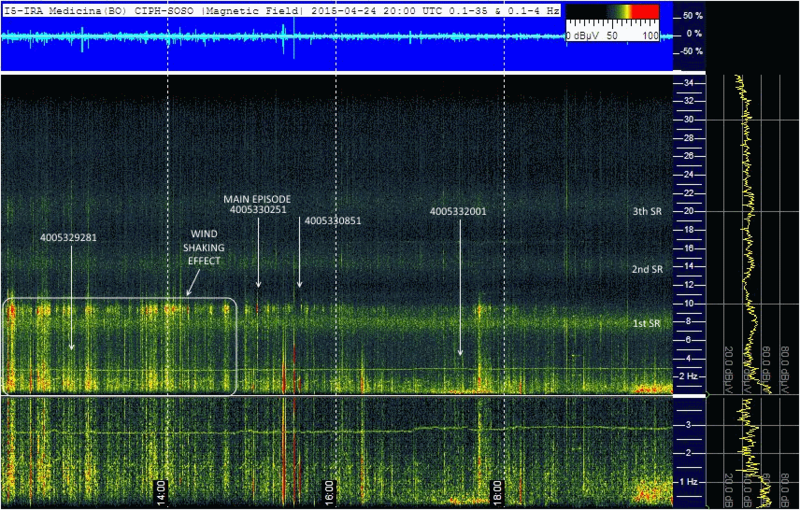 First Schumann resonance on right.